Nowadays, Feng Shui is increasingly important in our lives. And Feng Shui is giving us a better life, healthier and happier if we know how to apply Feng Shui principles in decorating home. If you have a happy family, you already own a nice house; maybe you should be particularly interested in decorating your own bedroom according to Feng Shui principles. 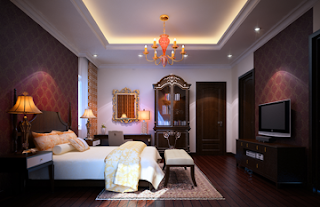 The homeowner bedroom has a great influence to the luck of the house, to the owner's health, to the family life and to the love between husband and wife. Rule 1: You must choose for your bedroom a good position. If so, under the theory of Feng Shui, all evil will be no more, bad things will become better. According to Feng Shui in the fortune, the bedroom should be designed at the place where have a lot of vitality or auspicious. Rule 2: You must choose for your bed a reasonable position. Your bed should not be too close to the bathroom. The bed and the bathroom door absolutely not are placed opposite. According to Feng Shui, if the owner's destiny is not good, the bed should not be placed under the hanging lights and near the kitchen door. Rule 3: You should not place your bed straight out t the door. Your bed is the place to help you relax, it should be quiet. According to Feng Shui, if the door straight to bed, when the door is opened, the outside air will blow straight into bed, this will absolutely not good for your health. Rule 4: You'd better put the bed-head close the walls, the bed-head should not be placed under the window and the bed should not be too close to the window. Rule 5: You should not place the mirror opposite the bed, included your makeup mirrors. Taboo 1: You should not decorate your room with objects capable of reflecting. You should not display things such as knives, swords; weapons... these things will destroy the quiet of your bedroom. Taboo 2: Your bedroom should not be too bright, because your bed is needed quiet, the too intense light will break the silence and you're relaxing. Hence, in the bedroom you should also use these types of small bright light intensity; do not use bright lights in the bedroom. Taboo 3: You should not use too showy red to decorate the room, showy red will make the human spirit too excited and prone to nervous breakdown, it can lead to mood negativity if you live in it for a long time. Therefore, you should decorate your room with harmony and comfort colors. You should not present too much metal in the bedroom because of the metallic colors are cool colors these will reduces the warm air in the room. Taboo 4: The bed should not be placed too close to the flowers. Flower of the yin (cold), metabolism during the night, they absorb oxygen and produce carbon dioxide, are not good for your health. Therefore, during the day, you should leave the trees in the room to air conditioning, but at night you should take it outside. If you are a homeowner, your bedroom is the most important room; you should apply the principles of Feng Shui to decorate your bedroom. And if you do this well, then your family will be healthy and happy and the fortune of the house will become better.